Should I Call the Maintenance Department or the Service Desk? IT service desks are branching out into other departments. This isn’t because IT workers want to control every possible aspect of a business, but because the service desk model is proving to be great for departments other than IT. For example, HR departments are starting to customize off-the-shelf IT help desk software for their own needs, such as providing a convenient way to process new employees, assign them a desk, and order the hardware and software they need. 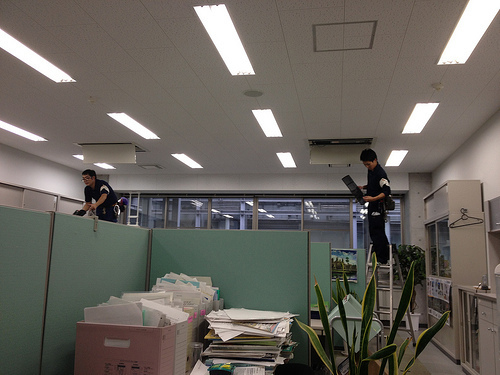 These maintenance guys are either staying on top of office lighting problems or planning an epic office prank. Maintenance departments are finding that the help desk ticket system can greatly assist in sorting out the variety of maintenance jobs that need to be done on a given day. But sometimes, there’s overlap between maintenance and IT, and it’s not quite clear which department you should contact. Here’s some guidance. The IT department handles software problems, but they also take care of a range of hardware too — from desktop computers to tablets used by field workers to office printers. Obviously, if you can’t log into your account, you ask the IT help desk for assistance. Depending on your company and whether or not it has a Bring Your Own Device (BYOD) policy and which devices IT supports, you may work with the service desk to install apps, download printer drivers, or order software for your company laptop. Maintenance deals with hardware, specifically heavy hardware that typically isn’t software-driven. In other words, if the AC starts blowing hot air in the middle of August, you call maintenance. But there are some gray areas when it comes to IT versus maintenance. Phones are a good example. If your business uses a hosted VoIP phone system, you will probably call the IT department when you have phone problems. But if your company has a hardwired PBX system, you probably need to call maintenance if you have phone troubles. Generally, the more “software-driven” a piece of hardware is, the more likely you should turn to the IT help desk when things go wrong. What if You Didn’t Have to Wonder Whether to Call IT or Maintenance? 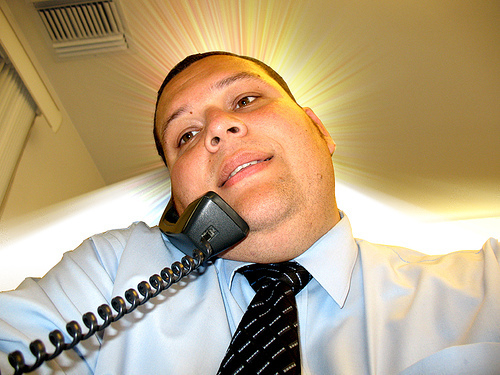 If you suddenly develop a halo, it’s best to call your company’s Director for Supernatural Affairs. One of the best things about the expansion of IT help desk software to include departments other than IT is that it can simplify things when you’re not sure which department to contact. Another benefit is that you can easily deal with multi-department problems in a short time period. Suppose you walk into work on a Monday. The light fixture above your office isn’t working, the printer is making alarming noises, and you remember that today is the deadline for submitting information for next year’s health insurance. Rather than calling maintenance, calling IT, and calling HR, you could log into your company’s self-service portal and deal with all three problems with a few keystrokes. When your company uses powerful, flexible, customizable help desk software you can easily expand the help desk model into departments other than IT. Not only will employees find it easier to get help from other departments from having used a similar system for IT problems, each department that uses the software can more easily track problems and follow up to ensure they’re taken care of. The IT service desk isn’t just for computer problems anymore. By having a central help system that covers multiple departments, your business runs more smoothly, and employees don’t have to waste time wondering who to call when a problem crops up.